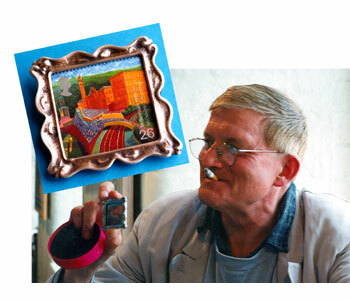 Since 1996 this leading contemporary jewellery gallery has been set within Salts Mill, home to the world's largest collection of work by David Hockney. Open daily, it specializes solely in contemporary jewellery, silver and metal smithing showcasing diverse collections by over seventy renowned designers and emerging talents from Britain and abroad. Much of the work on show pushes and blurs the boundaries between fine art, jewellery design and fashion resulting in jewellery that is, perhaps, best described as wearable art. Pieces are often created using a surprising range of materials and techniques. The gallery organizes a number of major exhibitions each year, some of which have been supported by funding from Arts Council England and the Crafts Council in recognition of the important role they play in showcasing the very best of British and international talent in Yorkshire and the UK. KLJ is also well known for its popular Annual Alternative Wedding Show, now in its 10th year. Alongside collections of wedding and engagement jewellery that we have all year round at the gallery, this show features the newest most distinctive individually designed and handcrafted rings and other bridal jewellery and tiaras. All can be created in silver, gold or platinum and set with stones of your choice. We’re always very happy to help you commission more personal pieces too. These can include stones and gold from existing family heirlooms. We also stock a wide range of rings for men, as well as cufflinks. The gallery is pleased to offer OwnArt, an Interest Free Loan Scheme set up by Arts Council England which enables people to purchase contemporary art/jewellery and pay for it over 10 months. Salts Mill is a magnificent Victorian textile mill built by Sir Titus Salt in the centre of Saltaire, the 'model village' he built to house his mill workers. Saltaire, which is surrounded by stunning scenery, was awarded World Heritage Status in 2001. Salts Mill was restored some 20 years ago to show the world's largest collection of works by the artist David Hockney - born in nearby Bradford. Along with Kath Libbert Jewellery Gallery, the Mill is also home to Salts Diner and a number of other designer shops and galleries. Kath Libbert Jewellery Gallery, Salts Mill, Saltaire, Bradford BD18 3LA. Tel/Fax 01274 599790. Please email us if you would like to be added to our mailing list for exhibitions and special gallery events.